Brown hopes to keep the “Kane Train” rolling with the upcoming release of his untitled sophomore album due out this November. He is chomping at the bit to release his new music, where he hopes to overcome the typical sophomore slump by showing off his songwriting skills and some musical versatility. You can get a taste of his penchant to push boundaries in his latest, laid back single “Weekend,” Brown said. “It’s got some country instruments in there to kind of trick your ear into it, but it’s also got a Bruno Mars feel to the way the drums hit,” he said. 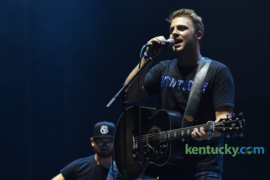 Brown is one of the featured acts of for the second night of the city’s annual Red, White and Boom Music Festival Aug. 31 through Sept. 2 at Rupp Arena. That night, Brown will be sharing the stage with Ashley McBryde, Chase Rice, Jake Owen and headliner Brad Paisley, who Brown has opened for on prior tour stops. Touring with the likes of Paisley, Red, White & Boom day one headliner Chris Young and 2016 RW&B headliners Florida Georgia Line has really helped him and his band elevate their live shows, he said. Brown appears to be at a point in his career where his craft and his popularity are both showing huge signs of progression. He initially got so popular on social media that mainstream country came to him. Now, as his star rises, he plans to keep the direction of his crazy ride rooted in his best interest. “I realize that this is my career and I need to speak up for myself and really get on board and not let other people dictate what I’m doing,” he said.